Extreme Output Elume LED Light Tape. Our extreme output, LED Light Tape outputs a perfectly even, bright, continuous light output along the 10M [32.8Ft] length for a seamless illumination. Cuttable in any 2" increment we offer custom manufactured plug and play lengths specific or the full 10M [32.8Ft] reel for an onsite hardwired installation depending on your project's requirements. 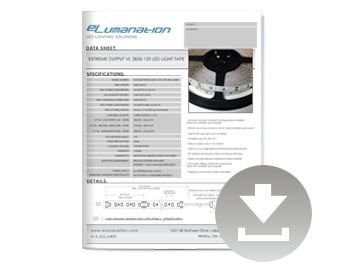 With various aluminum mounting channel options, three standard colour options or RGB and the ability to manufacture to your custom output level specifications our Elume LED Light Tape surpasses the performance and customizability of industry alternatives. We invite you to contact us to discuss your project's Elume LED Light Tape requirements with one of our knowledgeable design associates. Available in full continuous 10M [32.8Ft] reels onsite customization or fabricated to specific plug and play lengths as well as specific light level and kelvin temperature options to best suit each project's requirements. With our standard extreme output level model or the ability to manufacture to your custom, output level specifications with various colour and dimming method options our LED Light Tape is optimized to the ideal light level required for your application. Multiple aluminum mounting channel options with optional lenses not only add additional customization and aesthetic appeal yet act as thermal management systems diverting heat from the LEDs thus further ensuring the longevity of the LED Light Tape's lifespan. From concept to implementation, architects to end users, our knowledgable design consultants and technichians offer assistance throughout the project to meet your functional requirements and achieve your aesthetic lighting objective.